One man was killed in a three-vehicle crash in Dedham, Massachusetts Monday morning. 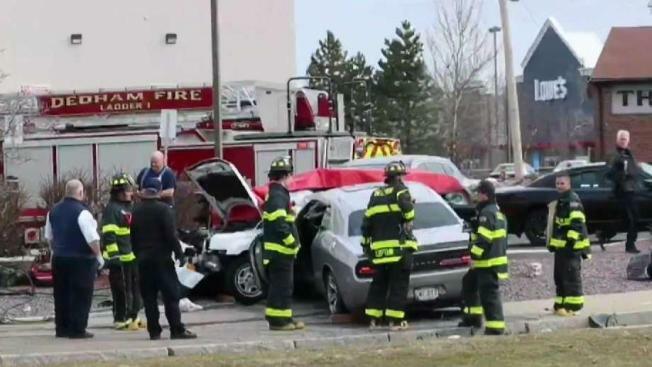 An investigation is underway after a man was killed in a multi-vehicle crash in Dedham, Massachusetts, according to authorities. The victim has been identified as Rowen Lowery, 65, of Boston. The Norfolk County district attorney's office said authorities responded to the scene at the intersection of Route 1 and Washington Street around 8:30 a.m. Monday. The driver of the second car, which evidence suggests had traveled over a portion of a traffic island prior to crash, was taken to a local hospital. The driver of a third vehicle involved in the crash did not require emergency medical transport, officials said. Police had asked drivers to avoid the area of the crash, which happened near the rotary on Providence Highway.